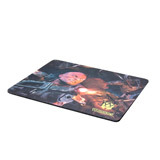 Mouse PAD (cloth) Gaming WS-G4. Size: width 22 cm. Length 18 cm. Width 22 cm. Length 18 cm. Notify me of updates to Mouse PAD (cloth) Gaming WS-G4.